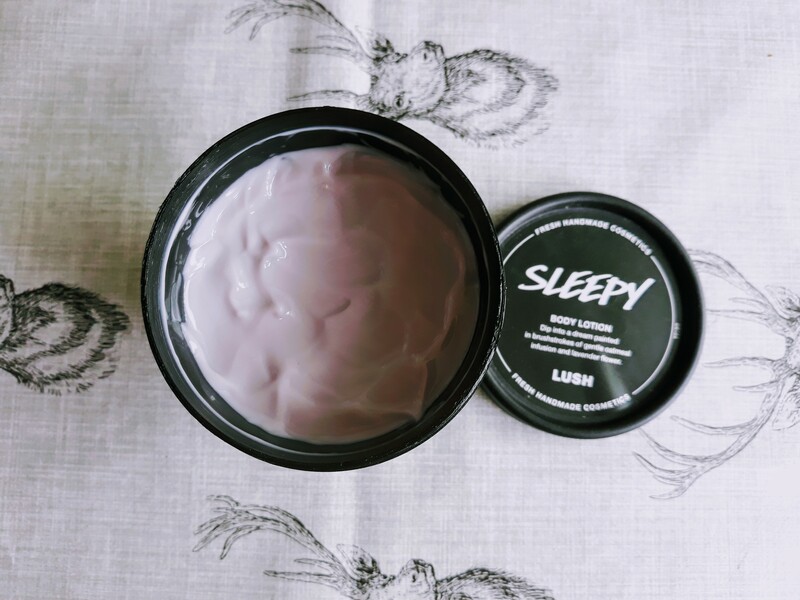 If you live in the UK, use social media platforms such as Instagram or Facebook or read the newspapers and haven’t heard of Lush’s new wonder product “sleepy” then where have you been? The print media has been full of gushing reviews for this product, autistic children who have never slept more than a few hours at a time were now sleeping a solid 8 hours, insomniacs were rejoicing. Doctors were claiming it was a breakthrough in the treatment of sleep disorders. Ok so I may have just made that last sentence up but you catch my drift. The media, including social media were full of praise for the product that was allowing the sleepless to finally get some sleep. So desperate had I become for a decent night’s sleep. I wanted to believe the hype. The product isn’t cheap at £13.95 for a measly 215g, ( Link to Lush website here) obviously the cure for insomnia is priceless but for most people in the real world spending £13.95 on a body lotion that may not even work probably seems a little extravagant. I have repeatedly moaned on here about how since giving up the fags (cigarettes) I am no longer sleeping. Initially when I stopped the first two weeks were heaven, then after that I was having problems with dropping off to sleep and then staying asleep. I have two types of insomnia, onset insomnia – where you can’t drop off and maintenance insomnia – where I can’t stay asleep. I don’t know which is more infuriating actually I do, its maintenance insomnia as that can happen to me within 30 minutes of falling asleep. I wake up and I am wide awake immediately and I can stay that way for hours. Onset insomnia is frustrating but I just get up and do something, read, have a cup of tea. I am currently in a pattern where one or two nights a week I am having trouble falling asleep. Every night I am waking up for several hours during the night. I knew the chances of Sleepy the Lush body lotion helping me be able to stay asleep was remote but at this point I was willing to give anything a go. I can’t remember which day I ordered the body lotion but it arrived within two days which is pretty good for ordering a product online and not paying extra for a named day delivery, I paid for standard delivery. The packaging wasn’t excessive and it arrived in tip-top condition. I was looking forward to trying the lotion when I went to bed. The colour is a little off-putting to me with it being a lurid purple. It really smells strongly of Lavender which is a scent known to aid sleep. I have tried dropping lavender oil on my pillow and using an oil burner in my room for an hour before going to bed in the past but it’s made zero difference. It also contains sweet Tonka bean but to be honest I can’t differentiate the smell from the lavender. As expected the product does feel gorgeous on my skin and a little goes a very long way. So now the £13.95 doesn’t seem so bad as it is going to take me awhile to get to the bottom of the pot. I applied the cream to my neck, back, arms and chest, all the areas close to my nose as it is the smell of the product that is going to help me sleep. I did also use it on my feet as they are dry with the change of the season. My skin did feel lovely the following morning, including my feet. The first night was a raging disappointment, despite falling off to sleep easily (which was nice) I was woken up by the pain of gastritis and the sound of a dog pacing around downstairs on the laminate floor at 1am. Usually a dog pacing around downstairs in the middle of the night is not a good sign, it’s normally a precursor to a dog vomiting. When I got into the lounge I found Frankie who seemed very out of sorts and very shaky on his feet. He had been fine the night before so I was very concerned. He didn’t want to eat when I had a banana and normally he’d sit and drool for that. When I returned upstairs I noticed that he was having great difficulty climbing the stairs. I managed to get him into my room and onto the bed (thankfully he jumped up unassisted) and I put the electric blanket on hoping that heat would help whatever was causing the problem. My husband got up a few hours later, I was still awake having not gone back to sleep. Frankie was worse again so I explained to hubby what had gone on earlier. The dogs were taken out for a very short walk and the alarm was set so we would get up early and ring the vets once they were open. I did finally manage to get a few hours sleep but it was a dreadful night and the quality was awful due to being stressed out over Frankie being ill. In an ideal world a product tester wouldn’t have all this drama going on. Frankie went to the vets with Mr Myastheniakid at 09.30am, due to Frankie’s age (he is 11 this week, as is Willow) I had convinced myself that this was the beginning of the end. The vet said she felt it was probably a flare up of Hip Dysplasia (a diagnosis I have never been entirely happy with as he has only ever had one problem with his hop and that was over 10 years ago. Of course that diagnosis made pet insurance ridiculously expensive.) Or he has developed arthritis in his hip. Frankie was a very good boy at the vets allowing them to take blood but he wasn’t happy at having his legs moved around. He came home off his face on painkillers, he can’t take the normal medication metacam or rimadyl as he pees blood, so he had no NSAID just a painkiller. Friday was an incredibly long day for me, hubby was late night meaning he wouldn’t be home until gone 9pm, so I would be dealing with a hallucinating dog by myself for the day. You could see Frankie was hallucinating as he was watching stuff that wasn’t there. Thankfully at about 2pm he went to sleep beside me and slept the rest of the day. Normally I am in bed by 7pm as sitting on the sofa makes me sore but that day I had to stay downstairs all day as I didn’t want Frankie injuring himself further by running down the stairs when Jay got home. BY the time Jay did come home the injection was starting to wear off and Frankie was more with it. I applied the Sleepy body lotion that night and was out like a light, I did wake up about 3am and was awake for a few hours. Again my skin was loving the lotion and was feeling very smooth. So that was two nights out of two where I had no problem getting to sleep and where I didn’t wake up within the first couple of hours of dropping off. Saturday morning it was clear that Frankie was in pain again, he was panting very hard, although he was moving better. When any of our dogs get an injury I try to treat them naturally by giving them Maxxiflex a tablet that can be bought on Amazon (and again I am not being paid to promote or advertise this product and each dog may react differently to this product so please speak to your vet). 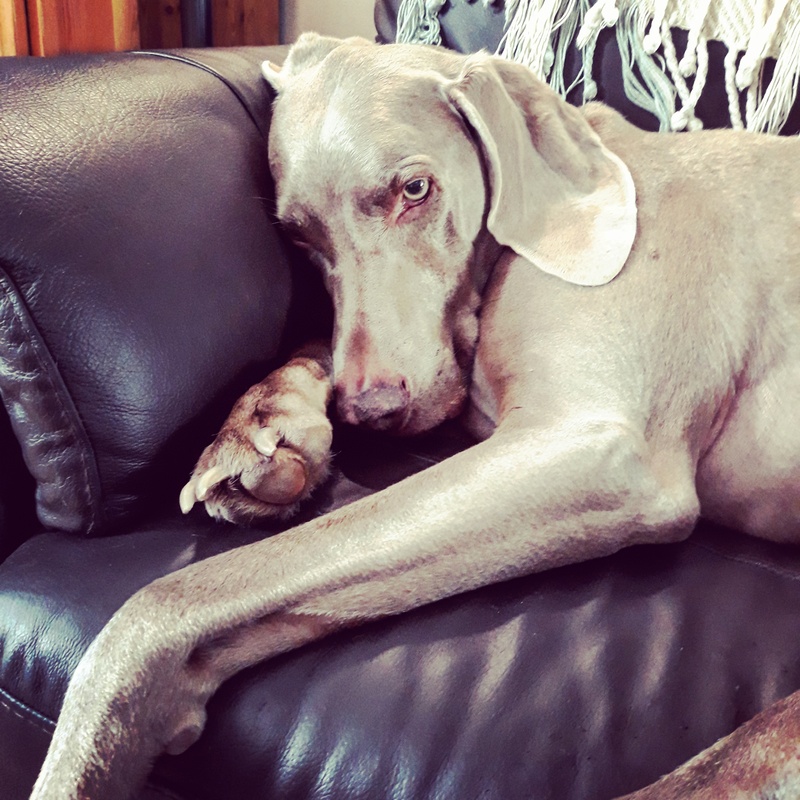 After two doses of this tablet Frankie was completely back to normal, bouncing around all over the place and no heavy panting or showing any signs of pain. 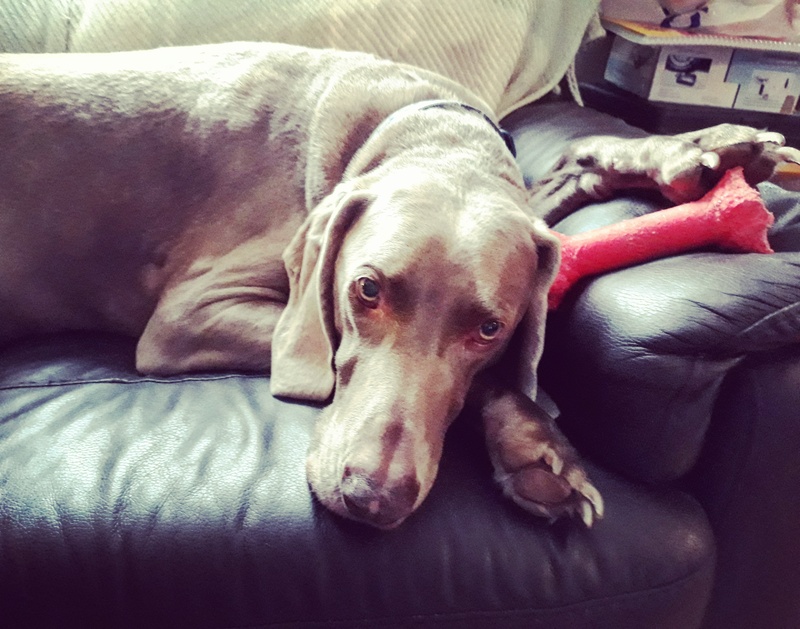 We kept him as quiet as it is possible for a Weimaraner to be quiet. By the time hubby came home on Saturday evening Frankie was jumping at the front door wanting to go out for a walk and he leapt into the back of the car without any issues. For the previous 24 he had been unable to get into the back of the car and had been lifted by hubby onto the back seats. Despite all the stress involved with looking after Frankie and having a Grandmother who was in hospital, I did remember to apply the Sleepy body lotion. I had the best nights sleep I have had in ages, I slept all the way through the night and woke up almost feeling refreshed. 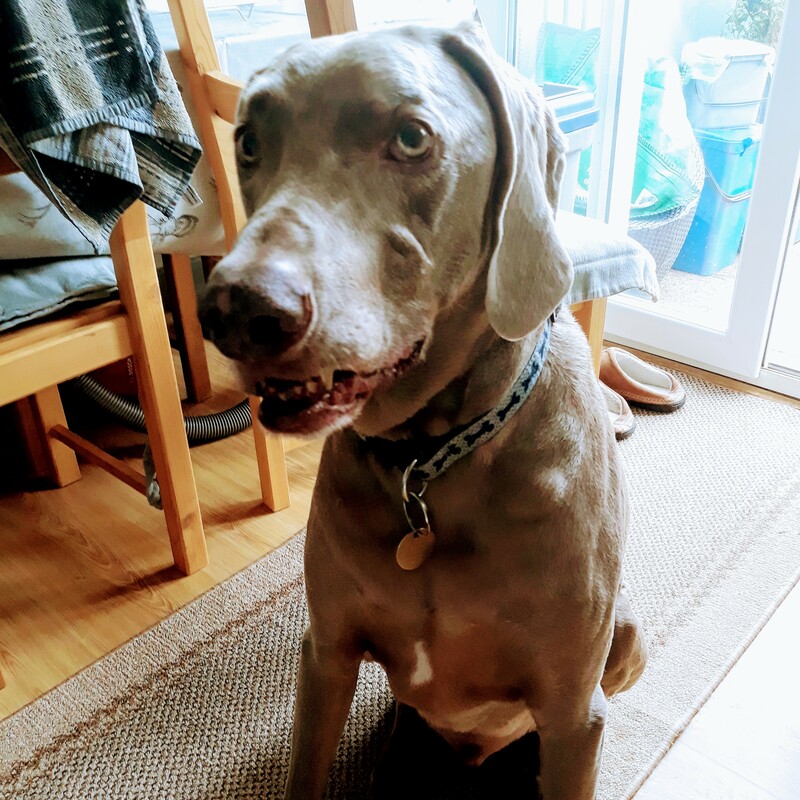 Frankie continued to improve Sunday, his blood test results would be back on Monday which may have given us an idea what was going on with him, be it arthritis, soft tissue injury etc. He was so much better today, we were quite surprised he had improved so much in the space of 48 hours. We were still “attempting” to keep him as quiet as possible, we were just very happy he wasn’t in pain. Sunday night I did the same ritual I had been performing since Thursday evening covering myself in the Lush Sleepy body lotion. I will be honest Sunday nights are a real problem for me at the best of times, I have had problems sleeping on a Sunday night since I was a child. I have always suffered from anxiety if there is a break in my routine, unless I was at home. So finishing school on a friday was fine as I would be at home but starting school / university / work on a Monday and the anxiety would stop me sleeping. Despite not working anymore and not having been in education for over 20 years, Sunday evenings are still angst ridden. Which means most Sundays I lie in bed for hours, sometimes until gone midnight before I drop off. This Sunday was no different, so the body lotion didn’t do anything at all for me, it was a tall order not even medication works on a Sunday evening. Monday, Frankie was completely back to normal, following me from room to room, annoying his mum / sister and me! He really was feeling an awful lot better. The vet rang late Monday afternoon and I found out that Frankie had a soft tissue injury his blood work had shown this and the vet was very pleased at how well he was doing, although Frankie still has to take it easy for bit. Yeah the vet has clearly never owned a Weimaraner! Due to Frankie’s age and size (39-41 kilos) he has developed a heart murmur. The vet said you can hear that one of his valves is leaking but it is very mild at the moment. He then went into signs that I need to look out for which will tell us that his heart is starting to fail (although the vet never said this, it was a case any of these symptoms and bring him in but I am not an idiot and know the score). So our boy isn’t a spring chicken anymore but he’s happy as Larry as long as his pack is together and that’s all that matters. Monday night – slept like a log, woke up at 3am was awake for two hours and then slept until 8am. Tuesday night – dropped off really quickly but woke up at 3am and stayed awake until gone 6am. Then slept until 8am. 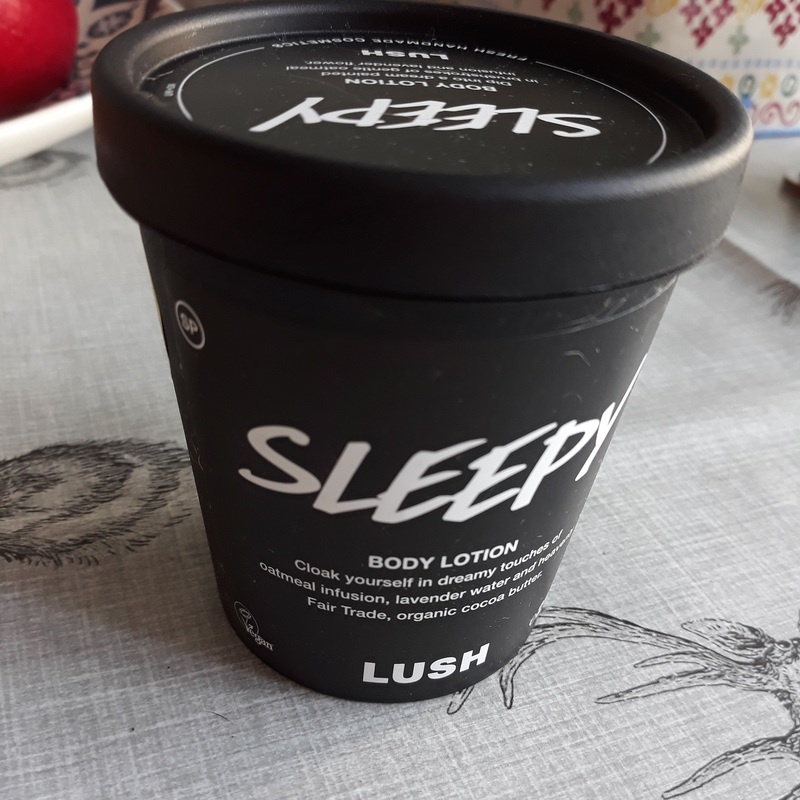 My overall verdict on the Lush Sleepy Body lotion, well it probably needs a bit longer really to give a really good review. However if you are suffering with onset insomnia not linked with anxiety, I’d say it was definitely worth a go as long as you are also practicing good sleep hygiene. If you aren’t I would suggest trying that first. If you have no problems getting off to sleep but suffer with maintenance insomnia then I’d say don’t waste your money, unless you apply it when you wake up in the middle of the night. I don’t know if it would help at all but it is something to try. It does smell really nice and it leaves your skin beautifully smooth. An added bonus I have discovered is that it is quite good on acne, probably due to the lavender in it. I get hormonal acne on my chin and this has calmed it right down and made it not look so red.